Geographical location. Population. 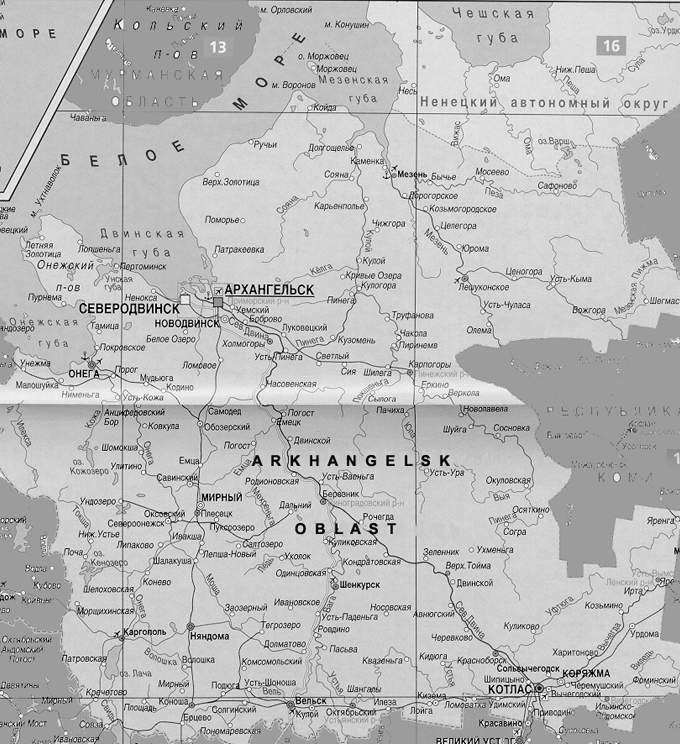 Arkhangelsk Oblast (territory - 587.4 th. sq.km) has an administrative border with the Republic of Karelia, the Vologda Oblast, the Republic of Komi and Tyumen Oblast. The Oblast is washed by of three Arctic Seas: White Sea, Barents Sea and Kara Sea. 39% of the territory of Arkhangelsk Oblast occupies forest, 24.2% - reindeer's pastures, 19%- islands. Natural resources. There are considerable resources of oil and gas, diamonds, bauxites, nickel, copper, gold and iodine in Arkhangelsk Oblast. Arkhangelsk Oblast has considerable forest and water resources. There are 70 th. big and small rivers, general extent of all rivers is about 275 th. km. Transport.Transport complex of Arkhangelsk Region includes sea, river, railway, air and motor transports. The density of railways is 3 km/1000 sq.km. ; automobile roads - 12 km/1000 sq. km. Extent of water ways is 4000 km. The sea transport plays main role in external economic links and service of coastal areas and islands of Arctic Region. Main cargo ports are Onega, Mezen', Nar'yan-Mar. Administrative - territorial division. Authority. Arkhangelsk Oblast includes: the Neneckiy national okrug, 20 districts, 13 cities, 38 settlements of urban type, about 4 thousand village settlements, island of archipelagoes the New Earth and Franz Joseph Land. The Legislative Assembly of Arkhangelsk Oblast is a standing legislative (representative) authority of Arkhangelsk Oblast. The regional administration consists of the governor's chancellery and various committees and departments (5 committees, 7 departments and 6 boards). The governor of Arkhangelsk Oblast is the highest executive and head all the executive bodies. Economy. GRP in Arkhangelsk Oblast in 1998 - R 22763,0 mln (USD 1099.7 mln), that amounts to 0.9% of GRP for Russian Federation (9.3% of GRP for Northwest of Russia). GRP per capital in Arkhangelsk Oblast in 1998 - R 15322.4 (USD 740.2). Industry. Main industries are wood and woodworking industry, pulp and paper industry, wood export, and fish industry. Timber industry complex makes more than 40% of total industrial output in Arkhangelsk Oblast. Wood export amounts to 9% of all-Russian wood output; production of saw-timbers - to 7% of total saw-timbers output in Russia, cellulose - to 33%, paper - to 9%, cardboards - to 36%. Another important industry - fish industry. Annual production volume in the fish industry makes up more than 150 thousand tons. The mechanical engineering complex plays significant role in Arkhangelsk economy. At the heart of the engineering complex are enterprises of the State Centre of nuclear shipbuilding (construction of nuclear submarines, civil shipbuilding). Construction of sleetproof drilling platforms for investigation & recovery of oil and gas on the shelf of Northern seas also is carried on. The State space centre "Pleseck" is situated in Arkhangelsk Oblast. Since 1997 total industrial output in Arkhangelsk Oblast has increased. In 1999 volume of industrial production amounts to R 27185 mln (22% increase over 1998 level). The woodworking and pulp and paper industries have the main share of total industrial output in 1999 (52.7%). Agriculture. Main branches are dairy and meat live-stock husbandry; cultivation of potatoes. Total area of agricultural land is 587 th.ha. Investment Activities & Investment Legislation.Total volume of investments into the economy of Arkhangelsk Oblast in 1999 - R 4233 mln (24 % increase over 1998 level). Main share of investments goes into industry (39%) and transport (36.1%). Total volume of foreign investments into the region in 1999 was USD 348.6 mln (15 times more than in 1998). Most of the foreign capital is invested in industrial sector (99.9%). In Arkhangelsk Oblast about 60 enterprises with foreign investment capital perform. In Arkhangelsk Oblast following main laws regulating investment activities in the region are accepted: "About investment activity in Arkhangelsk Oblast", "About regional zone for free enterprising in Arkhangelsk Oblast", "About state guaranties of obligations performance in the territory of Arkhangelsk Oblast". Осенью 2002 года Архангельская область отмечает 65 лет со дня своего основания. 24 сентября 2002 г. в пресс-центре Министерства иностранных дел РФ в Москве состоится презентация Архангельской области. Там же, в столице, пройдут многочисленные встречи официальной делегации с деловыми кругами и журналистами. 3 октября 2002 г. в Архангельске состоится заседание Регионального Совета Баренцева Евро-Арктического региона. 2-4 октября 2002 г. в Архангельске пройдут торжественные мероприятия, посвященные юбилею области.